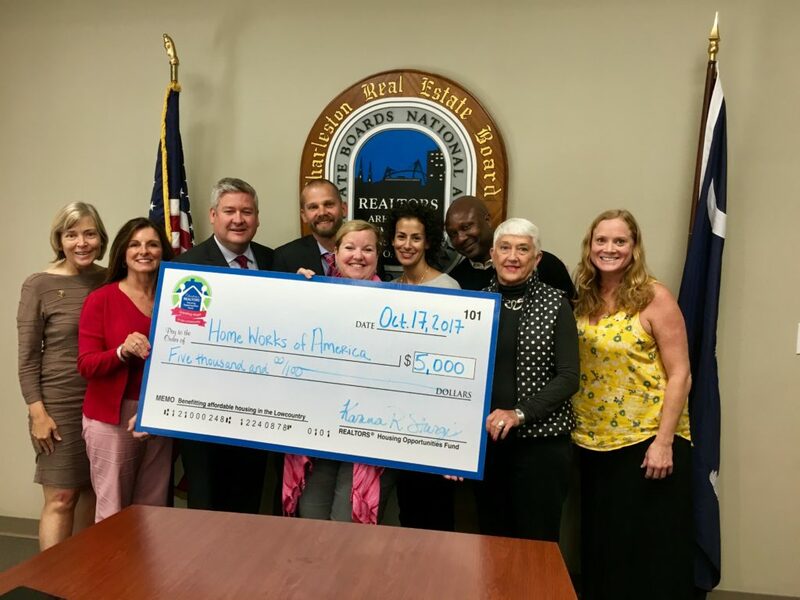 This October, the Realtors® Housing Opportunities Fund (RHOF) Committee presented a check to Home Works of America for $5,000 towards critical home repairs in the Lowcountry. This grant was just one of 6 grants totaling $27,000 for the summer grants cycle. When combined with the winter 2017 grants RHOF has given out nearly $50,000 in 2017 and over $911,000 since its inception in 2003. Since 2003, the Realtors® Housing Opportunities Fund (RHOF) has dedicated itself to assisting in the development, maintenance, or repair of housing for those in need, through its endowed fund and grant distributions to Lowcountry organizations committed to the development and rehabilitation of affordable housing. RHOF was founded in 2003 to address the growing need for affordable and safe housing for Lowcountry residents in need. The Fund is administered by the Coastal Community Foundation and since its inception, RHOF has provided nearly $1 million in funding to Lowcountry nonprofits. RHOF volunteers’ hands-on projects have included participation in build and/or repair days for the various Habitats for Humanities, Rural Mission, and Operation home; and recently, the construction of a wheelchair ramp for an immobile amputee who was effectively trapped in his home until a RHOF grant gave him the freedom of mobility. A $1,200 grant from RHOF covered the entire cost of construction. Last year, RHOF granted out more than $40,000 to local affordable housing organizations including: Dorchester, East Cooper, Berkeley, Sea Island, and Charleston Habitats for Humanity, Operation Home, United Methodist Relief Center, Human Needs Network, Humanities Foundation, Charleston Area CDC, Home Works of America and the Rural Mission. The funds distributed by RHOF can ease the cost of repair or reconstruction for those living in substandard housing. If you are interested in joining the committee, please email Claire@CharlestonRealtors.com.